1. Cuckoo Clock does not work? A. Please follow the setup instructions when unpacking the clock. B. Check the position of the night shut-off on some cuckoo clocks. This is the most common reason why the cuckoo and/or music does not work. Many battery operated clocks have an electric eye and make music/cuckoo when light is on. C. Are the clamps from inside the mechanical cuckoo clocks been removed ? D. Check that pendulum hangs freely from the clock & that clock hangs flush on the wall. E. Is the cuckoo's door been "unlocked" ? Turn the little wire to the side that secured the door while shipping. 2. A chain is off the wheel? To fix a weight that falls to the floor, pull the other chains up all the way and remove all of the weigths. Use wire and tie the other chains under the clock case as close to the bottom of the case. Take the clock off the wall and open it on the back. Turn the clock upside-down and balance the chain back on the wheel. The pendulum makes the mechanical cuckoo clocks keep the correct time. If the cuckoo clock runs too fast you can move the pendulum disc down, if the cuckoo clock runs too slow you can move the pendulum disc up. Make sure the cuckoo clock is in the correct vertical position so that the pendulum can swing freely. 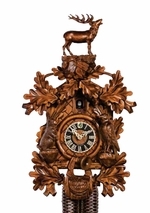 Make sure the mechanical cuckoo clock has an even tick-tock sound. Move the clock left or right until you hear the even tick tock sound. 5. Your Cuckoo Clock does not cuckoo on the full and half hour. The minute hand is in the wrong position. Loosen the hand nut, and reposition the minute hand to the correct hour and retighten the hand nut. 6. The Cuckoo sounds the wrong number of times for the hour. The hour hand is in the wrong position. Pull the hand at the attachment point on the shaft, pulling it towards the minute hand until it is loose. Then position the hand to the proper hour and push the hand to the dial until it is tight. 7. The cuckoo bird door stays open. Open the clock on the back and their is a thin wire that starts at the bellows and goes up to the cuckoo bird. This wire moves the cuckoo bird up and down while it sounds. It is connected under the cuckoo birds tail. The wire may have moved and is blocking the cuckoo bird from the door. Turn the wire around the cuckoo bird so that it is below the cuckoo bird tail again while the door is opened.